October 26, 2016 Dan O. Want to live forever? Or, just be an alien? When you get old, in most cases, you just get ready and wait to die. For a few folks at a senior citizens resort in Florida, they want to do more with their golden years. Instead of just withering away, remembering the past and dying peacefully, they want to go down loving the hell out of life and enjoying every second of it, as if they were just a bunch of young, ambitious 20-year-olds again. So by doing so, they discover a local pool that, for one reason or another, has a bunch of rocks at the bottom of it. What are they? And what do they exactly represent? Well, the fellas don’t really know, nor do they care. The only thing that they actually do know is that each and every time after getting out of the Cocoon, they disocver that they’ve got new and improved skills to them, where they’re able to move around like they once were able to and, of course, pleasure the ladies like they were still young whipper-snappers. It’s almost too good to be true for the guys and it turns out, that’s exactly the case when they discover that inside the rocks may hold something weird, or even sinister. What’s nice about Cocoon is that it features an interesting look at age and the idea of growing old, that we don’t too often see in films, especially mainstream ones. While Cocoon is, essentially, a movie about growing old and eventually dying, it’s also a film about living life to its fullest, no matter what age. While that all sounds incredibly corny and schmaltzy (which at times, it can be), director Ron Howard still handles it all perfectly because, well, it’s a movie about old people, with actual old people in it. So often do movies make elderly folks out to be bed-ridden, or wheelchair-ridden old geezers who always have something clever to say for laughs. With Cocoon, all of the elderly characters are given personalities and allowed to be as alive as any other younger person in a movie would get the chance to do. Howard is smart in that he always shows a certain admiration for these characters and never condescends to these older-folks; instead of showing them as old people who need to get on with the times and accept it all for what it is, he shows that they are just like us in ways, and that they need a little bit of spice in their lives to make them feel fully free and that anything can happen. And as the older-folks, Howard assembled a pretty solid cast. Everyone’s pretty good, with classic-names like Hume Cronyn, Jessica Tandy, Maurren Stapleton, Don Amece, and, in my opinion, the standout, Wilford Brimley. Now, of course, Amece won the Oscar for his role here and while nothing against him and his fun, spirited performance, it’s really Brimley who’s the heart and soul of this thing. There’s one key scene he has with his character’s grandson, where they talk about life and death, and what it all means, and it’s all just so beautiful to listen to. Brimley handles what could have been a very awkward moment, with such tender, love and care, that it almost makes us wish that there was a whole movie just about him and his character. Guess they didn’t read the sign that clearly specified, “no large rock-things in the pool”. That said, the whole entire Cocoon is about the old folks and their lives, which is basically where it all falls apart. 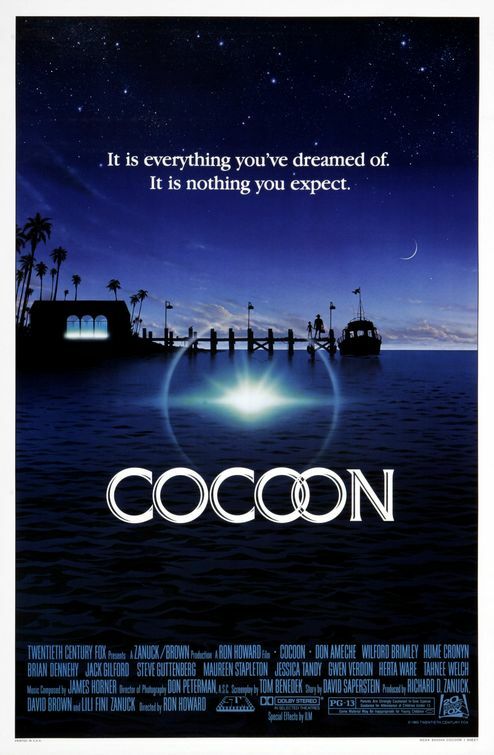 Sure, it makes sense that in order for Cocoon to succeed and be financially succesful to all audiences, and not just the old folks, that it would have a bunch of other characters, subplots, and yes, even some young, attractive faces and names to attract all of the youngsters to the cineplexes. In this case, one of the big, young and attractive faces was Steve Guttenberg and while he’s fine, if a bit hammy, he still doesn’t bring much to the movie that felt necessary, as was the case with Brian Dennehy’s alien character. It makes sense to have the sci-fi subplot to go along with everything else and help make sense of all the crazy stuff, but at the same time, Cocoon loses its step when it loses its sight of what it wants to be about. It wants to be about older people, growing old and accepting the life for what they’ve had, but at the same time, it also wants to be this weird, spooky sci-fi flick about two races and kinds of people accepting one another for what they are, a la Close Encounters. It’s just a weird dynamic that never fully comes together and, if anything, takes away from the older folks and their stories, because, after all, their stories are where the real heart and meat of the movie comes from. Without them, the movie would fail, but with them, then they save the movie. Next time, more old folks. Screw the sci-fi babble. Consensus: Even if it’s messy and unnecessarily overstuffed, Cocoon still benefits from a talented cast and an appreciation and understanding of age and life that’s hardly ever seen in movies.